In December 2015 our community suffered a terrible blow when we lost Tom Febrey. His death saddened us all — friends, students, alumni, colleagues, and of course his dear wife and our colleague, Sonjia. In Tom’s honor, a new endowment fund has been established – The Febrey Fund for Faculty Compensation. The earnings, but not the principal, will be used for faculty compensation; as this Fund grows it will help compensate faculty members at the level they deserve. Honoring our friend and teacher in this way provides a tangible pathway to fulfill Tom’s desire for stronger faculty compensation. 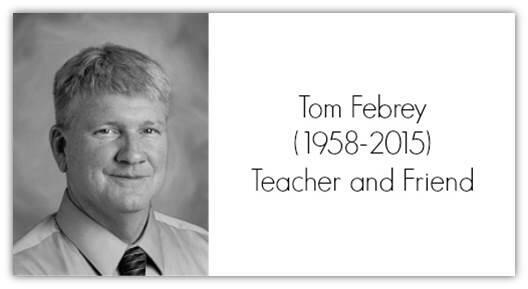 Tom cared deeply for his colleagues, and we are grateful to launch the Febrey Fund. We know that Tom’s memory will always sustain our faculty. If you wish make a contribution to this Fund, please make checks payable to Doane Stuart Febrey Fund or click here to make a gift on-line. If you choose to make a pledge, we can send you a Memo of Understanding, which enables one to donate over a 3-5 year period. Honoring our friend and teacher in this way provides a tangible pathway to fulfill Tom’s desire for stronger faculty compensation. We are grateful to launch the Febrey Fund. Tom’s memory will always sustain our faculty.